Proxy' Beauty was photographed September 2012. 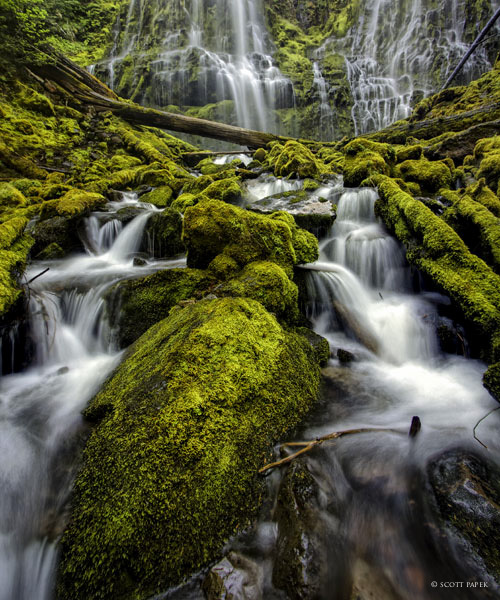 Fed by springs on the shoulder of North Sister, Proxy Creek breaks over a wall of columnar basalt liberally marinated in mosses, veiling 226 feet in two streams. One of the most striking characteristics of the falls is that the two primary viewpoints provide surprisingly different perspectives of the falls. From the end of the trail, the falls are viewed through a natural channel in the thick surrounding forest and appear as a fall widening mid-way down, and then narrowing slightly at the bottom. From the base of the falls, however, the top looks much more constricted and the base appears much wider than it does from further back. Photo © copyright by Scott Papek.